Below is a suggested guideline on how to use the complete ΩMEGA cleaning kit. You may not need all the components per cleaning session based on your needs and can just use the items that are necessary. Drape the clear plastic sheet over your cleaning surface then place the grease absorbent sheet on top. Your cleaning surface is now ready. Wear the black heavy duty powder free nitrile gloves to prevent fouling and residue getting on your hands. 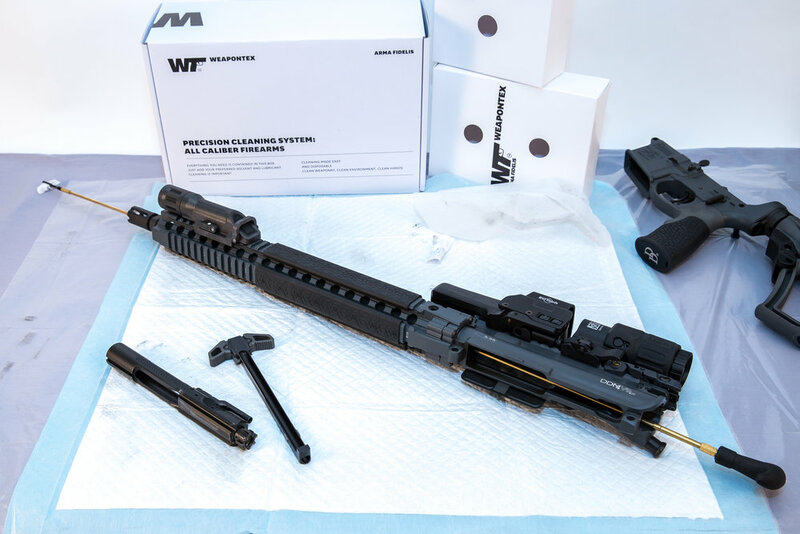 Properly unload your firearm, then disassemble and place parts on the sheet. Wear the white cleaning glove over the black glove. 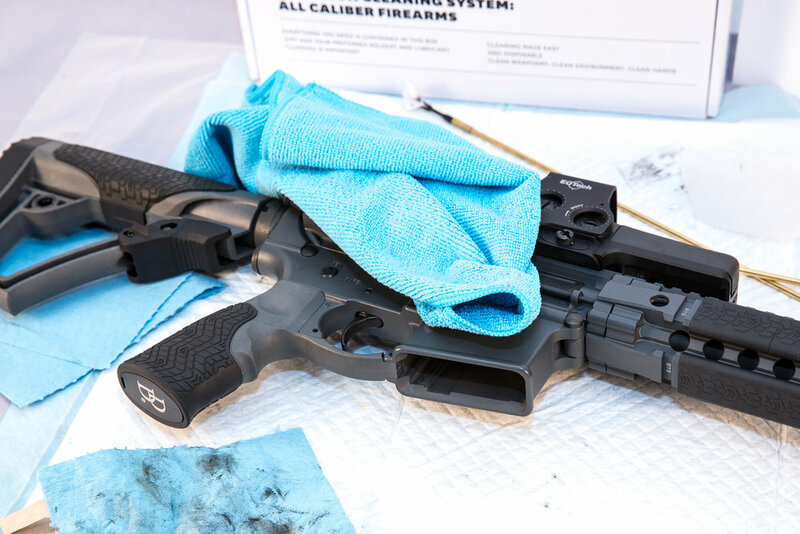 Your hand and fingers can be used to initially wipe off a lot of the residue on the various parts of your firearm. Adjust the cleaning rod to accommodate the length of your barrel and affix the appropriate patch holder. Select a patch, apply your oil based cleaner of choice (lubricants and oil not supplied) and gently push it through the barrel ONCE, removing the patch upon exiting the barrel. Do not pull the contaminated patch back down the barrel. Apply your oil based cleaner to either the part you are cleaning or to the heavy duty paper towel and wipe off the residue and fouling. 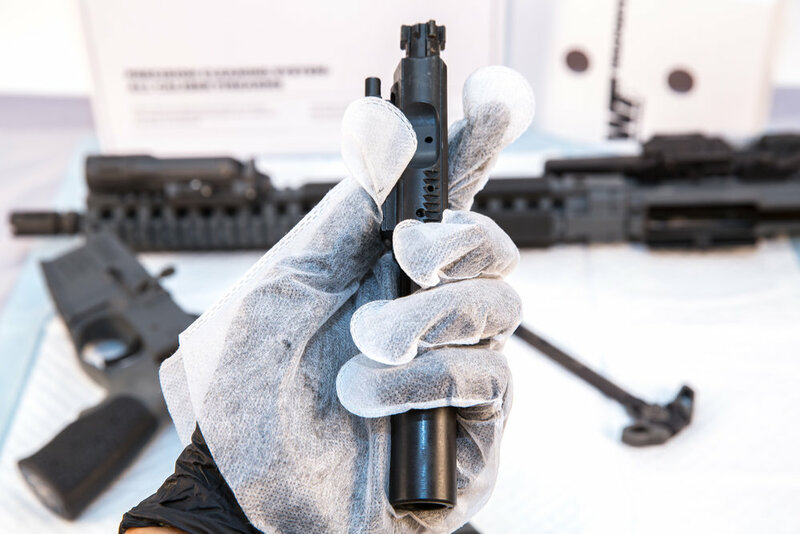 Using the gun picks and patches, proceed to clean all parts and interior of your firearm. The razorblade can be used to gently scrape off stubborn residue that has hardened over time. Use the cotton swab to clean tight to reach places, with the opposite sharp end doubling as a precision scraping tool. The pipe cleaner provides another method to pick up residue in tight corners. 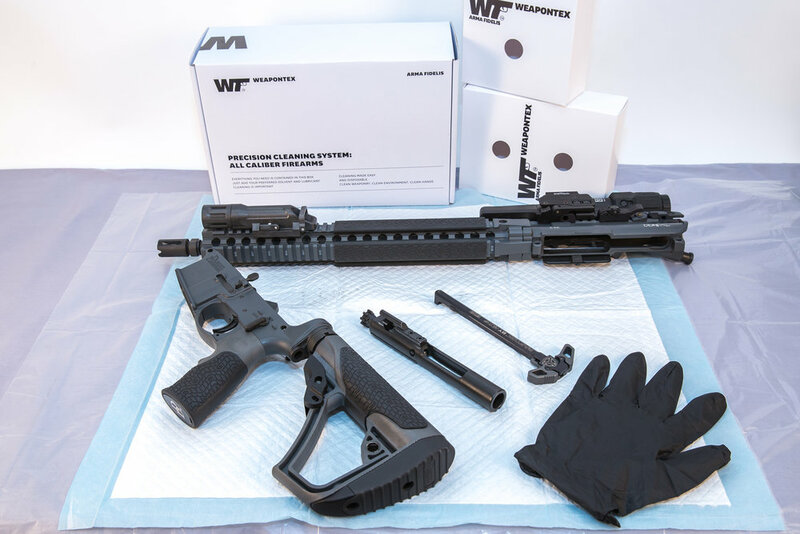 After lubricating and reassembling your firearm, use the microfiber towel to wipe the entire firearm, removing any excess oil, grease, fingerprints and dirt. Place all used materials in the supplied trash bag and dispose.